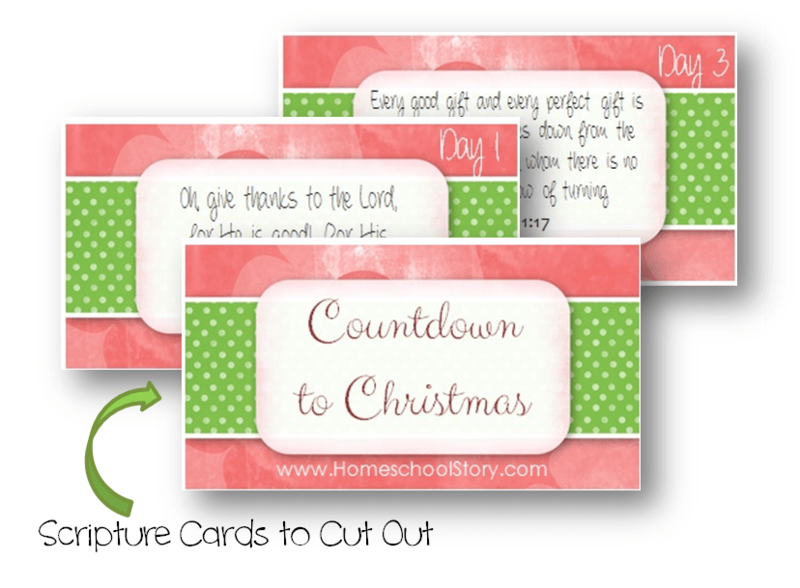 I am so excited to offer you our new Countdown to Christmas collection! 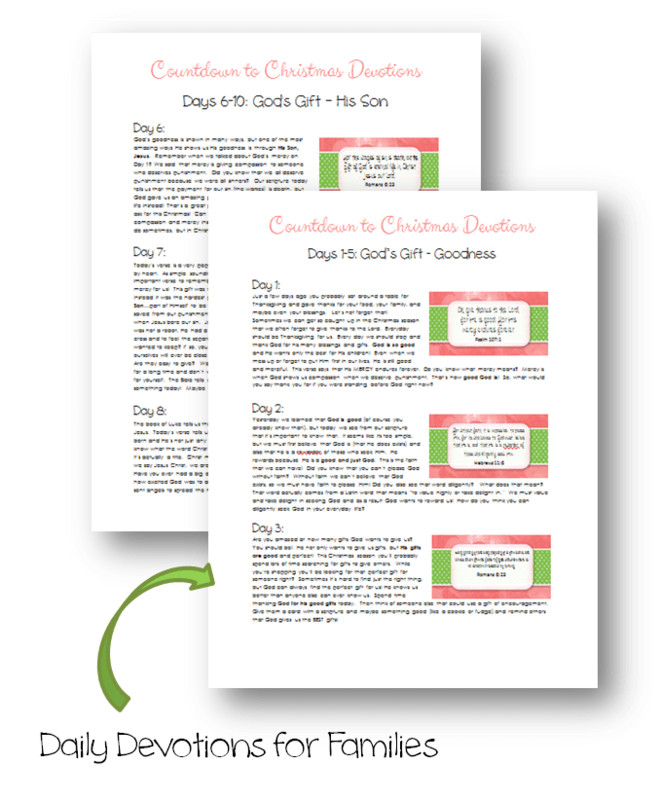 If you have been looking for a simple way to gather your family for a few minutes each day and focus on God’s blessings this Christmas season, then this set is for you! How many times do we have great intentions but just never get around to putting them to use? Don’t let this December be just another month! Pledge to take a few minutes and lead your children in a short devotion about God’s Goodness. 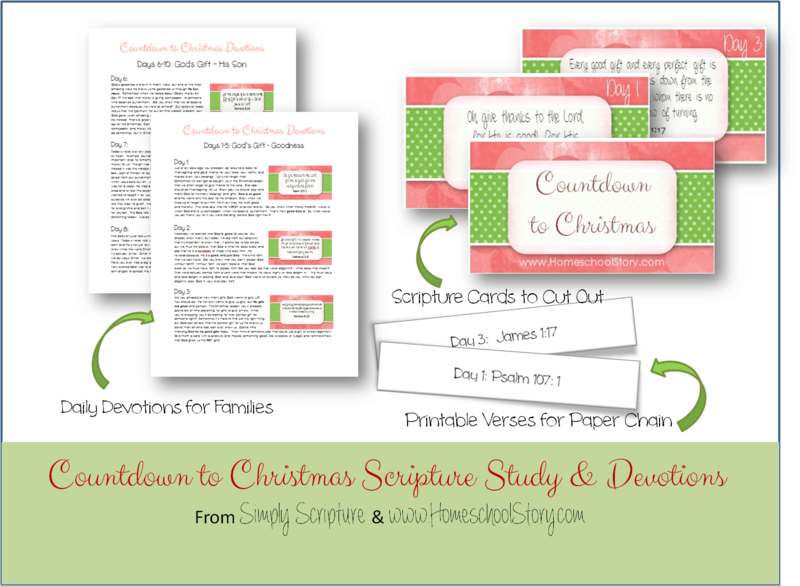 Each day you will have a scripture card and a short devotion that goes along with the verse. The devotions were created to be simple enough that even your little ones will understand, while providing wonderful thought provoking questions and insights for everyone. Along with thoughts about each scripture, the devotions also ask some deeper questions to help you have learning discussions as a family. Most days also provide an activity to challenge you to think about others around you! The devotions are divided into 5 sections (each 5 days). Dig into the Word as you focus on God’s Goodness, God’s Gift – His Son, God’s Gift of Peace, God’s Gift of Joy, and Our Gift to Others. Your beautiful full-color scripture cards can be printed out and hole punched to be placed on a ring, or just cut them out and put them on the wall or refrigerator as a daily reminder. Also included are paper chain strips with the scripture reference for each day’s reading. Cut them out and make a paper chain as another fun reminder of your daily devotions and a countdown to Christmas! Print them out on fun colored paper and add to your Christmas decorations. Make this December a time of learning together about God’s Word and focusing on how we can bless others!